Unless they’ve done a major remodel in the past, homeowners often know little about how a project comes together. They have an idea of what they want and expect, but they don’t necessarily know if those expectations and desires are realistic. For Massachusetts based design/build firm, Feinmann Inc, their number one goal is to listen to their clients so that they are able to provide the best possible experience at each stage of the project. We spoke with Owner and Founder, Peter Feinmann, about how his company handles different types of customers and their wants and needs. 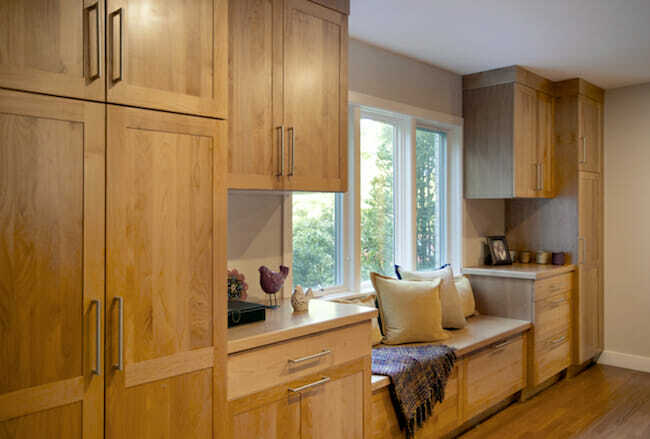 In this remodel, Feinmann’s team created an open floor plan by removing a wall to connect the kitchen and dining area, while also incorporating a powder room, study and pantry (pictured below). 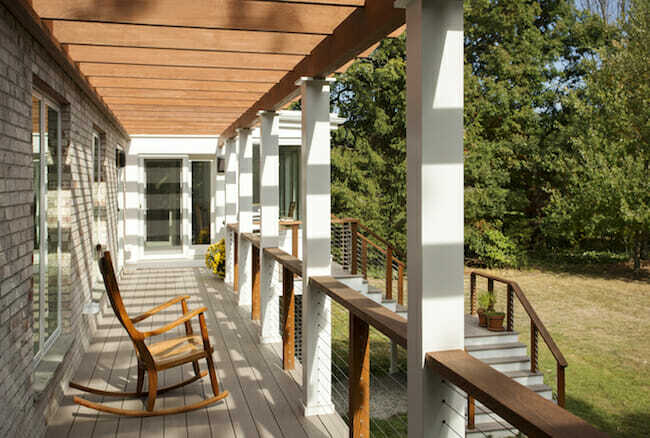 The first floor renovation was also combined with exterior alterations including converting the old deck into a sunroom and adding on a new deck with a pergola, columns, and a stairway to the backyard. Once he built a solid team, Feinmann went about instilling his values into the company culture. For Feinmann, one of those values is collaboration. Collaboration, he says, is “the piece that makes us unique.” And whether that’s between architects and designers, designers and project managers, project managers and carpenters, project managers and clients, or all of the above, “my job as a manager is to make sure that all the important conversations are happening regularly. That’s the culture, and it goes to serving the client the best way possible,” Feinmann says. Making customers happy is fairly simple when everything is running smoothly, but what happens when a problem arises? For Feinmann, it’s all about making the situation right. Feinmann Inc. was contracted by a family to work on their screen porch, and because that project was such a success, the family reached back out about a kitchen renovation. Things started off great in the kitchen, but a problem developed when the final coat of lacquer on the cabinets trapped moisture between the paint coat and topcoat. The cabinets suddenly developed a haze that caught everyone off guard. According to Project Manager/Home Crew Manager, Tammy Russo, “we were looking at one area of the cabinets thinking: this looks odd. It flummoxed me.” Company crews cleaned the cabinets, but the haze just reappeared. Russo called the cabinet factory and it turned out that a bad run of paint in the latter part of May and into June was the source of the problem. The cabinet company sent a rep out and eventually removed and re-covered the doors, drawers and shelving. Feinmann Inc. carpenters sealed off the finished space and re-finished the emptied cabinets on the floors and walls. 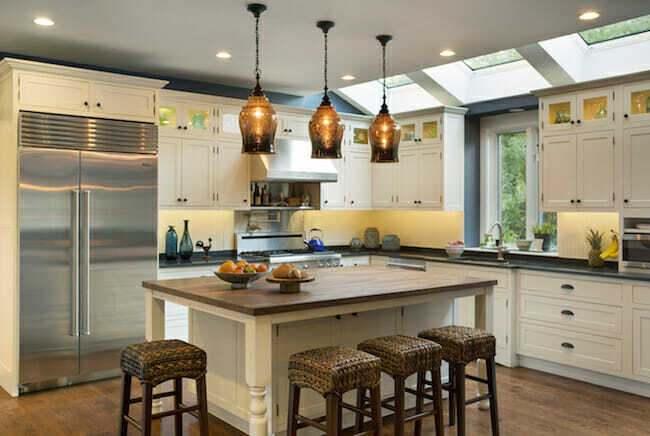 The finished project is subtle and elegant, featuring wide-plank floors, an island with three free-standing legs, and a U-shaped kitchen work space, all illuminated by newly installed skylights. An unresolved flaw could have spoiled this entire project, but because of strong supplier relations, skilled tradespeople, and a commitment to serving the client, everything turned out just fine. Feinmann and his team have worked hard to develop a positive reputation with their clients. Constantly communicating, having a great team, and resolving issues quickly are just a few of the ways Feinmann Inc. is able to provide such a great experience. A remodeling project may be new for the homeowner, but you know what you’re doing, so having a system in place to handle different scenarios and issues will help you eliminate unexpected surprises and delight your client.